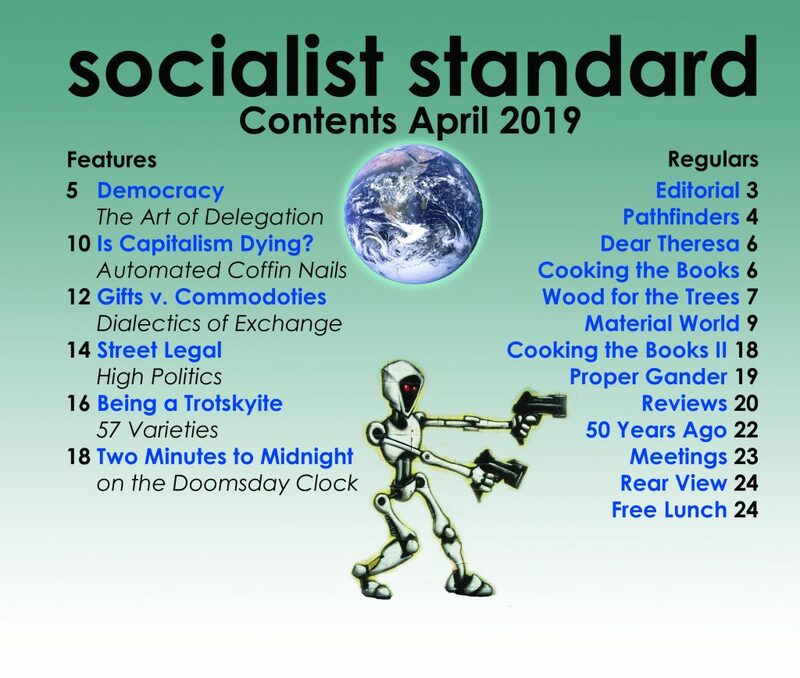 The introduction to our new pamphlet Strange Meeting: Socialism and World War One which brings together articles published in the Socialist Standard at the time. With the advent of its hundredth anniversary, establishment apologists will be seizing every opportunity to justify this truly appalling war in the name of remembrance, seeking to glorify this callous implementation of state violence as a laudable defence of freedom and democracy, neither of which most of the combatants would ever have enjoyed in their lifetime. In reality, of course, the recurring purpose of war is the preservation of the particular financial and territorial interests of one set of capitalist powers against the encroachment of their equally ruthless rivals seeking a different outcome. Substituting ‘power and markets’ for ‘freedom and democracy’ in every history book would yield a narrative embracing far greater clarity and veracity. 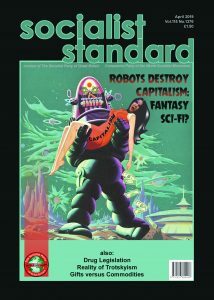 In pursuit of capitalist self-interest, members of the working class are routinely regarded by their rulers as a disposable commodity, all too easily seduced into compliance with war by appeals to patriotic duty and cynical promises for a brighter future – only to discover that the ‘land fit for heroes’ is a mirage. Unlike the French and German armies, the UK units of the Territorial and Regular Army consisted entirely of volunteers. So effective was the British recruitment campaign that between July and September 1914, the number of volunteers rose from 100,000 to 400,000 plus. When Lord Kitchener was appointed Minister of War in August, he announced the formation of a new army (Kitchener’s Army). Within 5 months numbers increased by well over a million; nevertheless conscription was introduced in January 1916. The new army was first deployed at Loos and in 1916 fought at the Battle of the Somme – the initial catastrophic assault on 1st July unfondly remembered as the ’Big Push’. Lasting until the 19th November, the amount of territory gained was a paltry seven miles of muddy terrain. The 4½ months of brutal exchanges resulted in a combined total of almost a million casualties; the British losing nearly 60,000 men on the first day to move forward less than a mile. When Commander-in-Chief Douglas Haig finally called off the attack, the first day objectives of Bapaume and Serre were still three miles distant. The original 400,000 volunteers formed part of the British Expeditionary Force – the ‘Old Contemptibles’. The horrendous carnage reaped during the many bloody battles of WW1 serve as a grim reminder that, so far as the ruling élite are concerned, the ‘Old Contemptibles’ were the ‘Old Expendables’. According to the French Army Commander, General Phillipe Petain ‘…success will come to the side that has the last man standing’. Given the large number of animals also sacrificed, as was the case, he should have added ‘… or pigeon, or horse, or dog’. His gloomy prediction was made in 1916, the year that the Battle of Verdun was fought between the French and German armies. In the space of 10 months around a million or so soldiers were killed or wounded and the French forces finished up back where they started. It has been well said that in time of war truth is the first casualty, an observation emphatically endorsed by all governments in the course of WW1. The state propaganda machine immediately sprang into action, ably assisted by the loyal cohorts of the press. Especially by Lord Northcliffe, proprietor of the Times and the Daily Mail which, in view of its mass circulation and mostly conservative readership was a useful outlet for promoting the official line. Indeed, Northcliffe himself was to be the director of propaganda bureau in enemy countries and became known to the Germans as ‘the Minister for Lying’ (the Allies were dubbed ‘the All-Lies’). As early as September 1914, a War Propaganda unit was set up utilising the literary talents of respected luminaries such as H.G. Wells, Conan Doyle and Rudyard Kipling. Earlier still, on 8th August 1914, the Defence of the Realm Act (DORA) was passed by parliament. This afforded the government enormous powers, enabling them to take over the coal mines, railway and shipping. Newspapers and magazines or any other publication could be censored or shut down and any land, factory or workshop placed under state control. A list of restrictions was published for public digestion. No one was permitted to buy binoculars, purchase brandy or whisky at a railway refreshment room, give bread to horses or chickens, stand a round of drinks in a pub or use invisible ink when writing abroad – an immense relief to all those in the habit of doing so at home. Publicans were allowed to water down beer, a practice widely assumed to have preceded the government edict. Any civilian in violation of the new laws could be put on trial. To ensure maximum daylight for the production of essential supplies such as food and munitions, British Summer Time was introduced. Women, whose skills and potential had hitherto received scant attention from the state were suddenly deemed vitally important – that is to say important to the war effort. They were speedily recruited for jobs in government-owned munitions factories (munitionettes), in farming (Women’s Land Army), as fire-fighters, as bus conductors and for various non-combatant roles in the WAAC, WRNS and WRAF or the First Aid Nursing Yeomanry (FANY). Needless to say, as soon as the war was over the government was keen for them to return to their ‘traditional’ role as homemakers. Reporting of the war was strictly controlled to ensure that only ‘good news’ was shared with the general public. A Ministry of Information was established and also a War Office Press Bureau. Any reports from the front were suitably watered down before being released. In essence, the ‘news’ consisted of a mixture of silence, distortion, half-truths, fantasy and misinformation (downright lies). Ludicrous rumours, purporting to be evidence of inhuman atrocities carried out by the Germans, were circulated by the various propaganda agencies. Special magazines were published that reinforced the picture of the war that the state wished to paint, drawing in readers by titillating titles: The War Illustrated, The War Pictorial, The Illustrated War News. All possible means were employed to generate anti-German sentiment – even board games and toys – and in 1916 a film was released entitled ‘The Battle of the Somme’. Sanctioning its showing was a massive risk as it contained footage of actual battles, including troops being killed. It was calculated that the shots of British soldiers cheerfully advancing would inspire a mood of optimism that trumped any negative reaction. It was judged to be a success, but almost certainly it proved to be a double-edged sword. By the end of 1916, as ’bad news’ was also starting to filter through the propaganda smokescreen, public perceptions were changing. Regrettably, these changing perceptions did little to soften the hostility towards anyone who opposed the war. Indeed, the burgeoning resentment of those unfortunate enough to have lost loves ones – in some cases an entire generation of male family members – often led to the adoption of even more uncompromising attitudes. Men, eligible for military service but choosing not to enrol were commonly ostracised by their own families. The longer the war went on the more aggressive became the intolerance towards conscientious objectors, conscription dodgers and deserters. At the commencement of the war things were not too unbearable for them; after all, as everyone believed, it would all be over by Christmas. Few paid attention to the contrary opinion voiced by Lord Kitchener. Also, prior to the 1916 Military Service Act, those who did not volunteer were in no way breaking the law. But after conscription was made compulsory for all fit men between the ages of 19 and 41, an exemption certificate was required to escape it. The grounds for exemption were few and some were more readily granted than others. There were four basic categories: 1) Men required for alternative work on behalf of the state. 2) The prospect of serious hardship due to exceptional financial or business obligations or domestic position. 3) Infirmity or ill health. 4) Conscientious objectors. Much of the unpleasantness sustained by objectors was fanned by the role played by women’s organisation like the Mother’s Union and the zealous, high profile support of the National War policy by Emmeline and Christabel Pankhurst. The Mother’s Union and some other women’s associations encourage their members to persuade anyone of call-up age to enlist without delay and were an integral part of the government recruitment drive. One of the cleverest, but most insidious posters produced by the state propaganda team declared: ‘Women of Britain say – GO!’ Such was the impression made by this and other similar slogans that it was not unusual for a mother to shun a non-serving son out of shame. Shortly after the start of the war, Admiral Charles Fitzgerald founded the Order of the White Feather, which Emmeline and Christabel Pankhurst enthusiastically embraced. The feathers were meant to be presented only to those positively identified as young men avoiding military service. But, so indiscriminate did their distribution become that the authorities were forced to requisition special badges bearing the legend ‘King and Country’ for civilians working in state industries or government departments. Also, those servicemen discharged through injury or sickness were issued with the Silver War Badge. Unfortunately they failed to prevent challenges and sometimes physical attacks being directed at the wrong targets with a White Feather once famously presented to a holder of the Victoria Cross. Fenner Brockway, a pacifist member of the Independent Labour Party, and later a Labour Party MP, claimed to have received enough white feathers to make a fan. There were some cases, however, of men deciding to enlist subsequent to White Feather embarrassment. The treatment of conscientious objectors was undeniably harsh, and universally so. In the UK alone they numbered over 16,000, though most were not absolutist and elected to do some form of voluntary service such as ambulance driving or agricultural work. 6,000 were given prison sentences and generally endured brutal treatment, abuse and extremely poor conditions. A number were sent by the army board to France, where they were classified as being on active service. Under French military regulations 36 were sentenced to death, later reduced by Earl Haig to 10 years’ penal servitude, but some were released as early as 1919. No conscientious objector was ever executed in Britain but 41 died in custody as a result of inhuman treatment. There were a thousand women conscientious objectors as well and since they included a high percentage of absolutists, half of them were sent to prison. Interestingly, most of the soldiers who fought in the trenches were better able to understand and respect the stand taken by the conscientious objectors than those civilians who behaved so vindictively towards them at home. Between 1914 and 1920 over three thousand British soldiers were sentenced to death for ‘cowardice’, ‘desertion’, ‘striking an officer’, ‘falling asleep on sentry duty’, ‘casting away arms’, ‘refusing to obey an order’ or various other violation of military regulations. Of these, 306 were executed for purely military offences. A further 40 were shot for committing offences of a criminal nature, including murder, in addition to breaking military laws. Many of the 306 charged and found guilty of purely military violations were among the estimated 80 thousand British soldiers who were suffering shell shock, a condition not recognised by the military courts martial. Some were simply overwhelmed by sheer fatigue or, unable to cope with the sustained mental pressure of unrelenting conflict, lost their nerve. While it is true that they were granted legal representation of a sort, the trials rarely lasted longer than half an hour, often no more than 20 minutes and no appeal was allowed. Military justice was assuredly swift. Although there were 16,000 individuals who, commendably, took a stand against WW1, it was the Socialist Party of Great Britain alone who did so unequivocally as a matter of political party policy. We argued that this conflict was not caused by the assassination of Archduke Ferdinand, or by German military imperialism, or by an arms race. These happenings were offered as justification at the time, but were nothing more than the consequences of a deeper underlying and ongoing cause. Sadly, truth is not a requirement for ‘A’ Level history. The abiding reality is that this war, as others before it and since, was the result of the ever-present struggle by competing national powers and alliances for territorial supremacy and market dominance. Nothing has changed! WW1 was not only the inevitable result of rampant class-riddled capitalism, but it provided graphic evidence of the obscene lengths to which those who support such a system are prepared to go to perpetuate it. This ridiculous war involved over 30 countries and resulted in over 9 million soldiers being killed and 21 million injured. A mind-boggling 12,000 miles of tunnels were dug by both sides, creating a rat-infested, disease-ridden environment. For this purpose the British and French between them used no fewer than 140,000 Chinese labourers (Chinese Labour Corps). Coal miners were recruited to dig tunnels and place explosive devices in enemy territory – tunnels in which some remained entombed. Poison gas was employed as a weapon of war (used first by the French) and an act of genocide by the Turks eliminated 1½ million Armenians. In addition, of course, it brought untold grief to thousands of families. Nothing was resolved by the war; it ended in stalemate rather than checkmate. But further seeds had been sown that would yield an even more destructive conflict. Few, if any, lessons have been learned about the fundamental flaws of a society which continues to be run by a few to the detriment of the many. For as long as the abundant resources of our planet are exploited for profit rather than produced for need, wars will continue. Just as the Socialist Party has been pointing out for over a hundred years. We will keep on doing so until common-sense prevails. Copies of the pamphlet are available from the Socialist Party, 52 Clapham High Street, London SW4 for £4.50 including postage and packaging. Cheques to be made out to ‘The Socialist Party of Great Britain’.